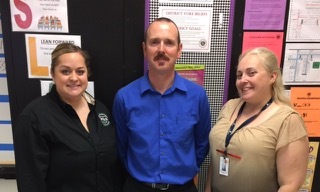 We are excited to highlight the teaching team at Robert T. Hill Middle School as the Team of the Month for May! Hill’s Impact Manager, Courtney Fadley, chose to highlight Hill. Courtney shared with the Hill team that she chose to highlight them because “as a team, you all rallied around our program from the very beginning. It is not often that we have schools start in January and complete as much of the program as you all have, especially with 6th graders! You all have taken the opportunity to encourage, engage, and empower the young minds of your students with information that is so crucial to their futures. I love being ears and eyes in your classrooms as you facilitate the program. The following quote from one of your 6th graders is such a great picture of what you all as social studies teachers bring to our program. Read on to learn more about team lead Ms. Neal! The team lead at Hill is Ms. Neal, a 6th grade World Cultures teacher. Favorite College Memory: While at TWU, I loved having the freedom to decide what I wanted to make of my future. College is where I was able to discover who I truly was as an individual. I have an undying passion for helping students achieve their dreams and overcome everyday obstacles. As a teacher, I am able to reach many students on a daily basis and do what I absolutely love. Share a quote you find inspiring. What is one thing you like most about your 6th grade social studies team? As a 6th grade Social Studies team, we are able to work together and to achieve the same goal which is creating life long learners.